The title “Cost Effective Validation Documentation” refers to a suite of documents that the FDA, WHO and the EC have predicated as essential in establishing that a regulatory controlled product has been produced in compliance with current Good Manufacturing Practices (cGMP) and meets or exceeds all required specifications; as listed in the User Requirements Specification (URS). Cost Effective Validation Documentation introduction. 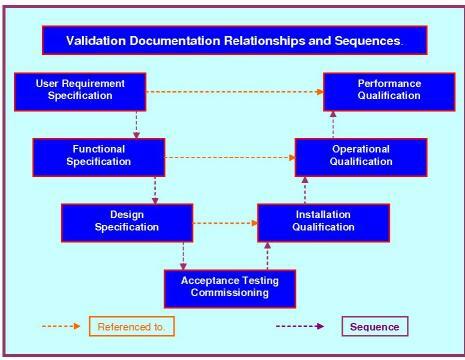 The evolution of Validation required the development of suitable documents, such as the VMP, URS, DQ, IO, OQ, P1Q, P2Q. Many manufacturing processes produce a product or part of a product that cannot be tested without damaging it, or indeed destroying it. The introduction of QA allowed manufacturers to build and destructively test, then using rigorously enforced quality controls replicate the tested product exactly, now knowing its performance and limitations. Pharmaceutical, biopharm and medical device companies must demonstrate to the regulators that their whole operation is under similar control. Quality Control that will ensure all operations are documented, all materials are verified as correct and all equipment is qualified as fit for purpose. All this must be in place and operational prior to receiving regulatory approval to manufacture. This status must be maintained to a standard that ensures consistent replication of all the production processes and without ever compromising the quality of that product. The maintenance of these standards is called Current Good Manufacturing Practice (cGMP). This qualified or approved state is subject to continuous ministering and inspection by the regulatory authorities involved, as long as the product is in production. There shall be written procedures for production and process control designed to assure that the drug products have the identity, strength, quality, and purity they purport or are represented to possess. Such procedures shall include all requirements in this sub-part. These written procedures, including any changes, shall be drafted, reviewed, and approved by the appropriate organizational units and reviewed and approved by the quality control unit. (1) Documented instructions, standard operating procedures (SOP's). (2) Monitoring and control of process parameters. (3) Compliance with specified reference standards or codes. (4) The approval of processes and process equipment. (5) Criteria for quality of workmanship.